Posted: Tue Jul 07, 2015 4:04 pm Post subject: Drone or foreign bee? This time got my camera. Photo is not great but clearly the bee on the left is much bigger than the workers. Is that drone or foreign bee that is robbing my hive? I have not noticed any aggresive behaviour towards it. I've been observing my hive entrance pretty much daily but this is the first time I saw them. Is it because I've never watched them this time around 4:30pm? Or is it a time of the month/year with higher drone activity? Yes it's a drone and I find that there is what I call drone "play time" in the afternoon when the drones seem to "come out to play". On a warm sunny afternoon there will be a period of 30mins - an hour when the drones are really active at the entrance and often skittering about on the ground near the hive. 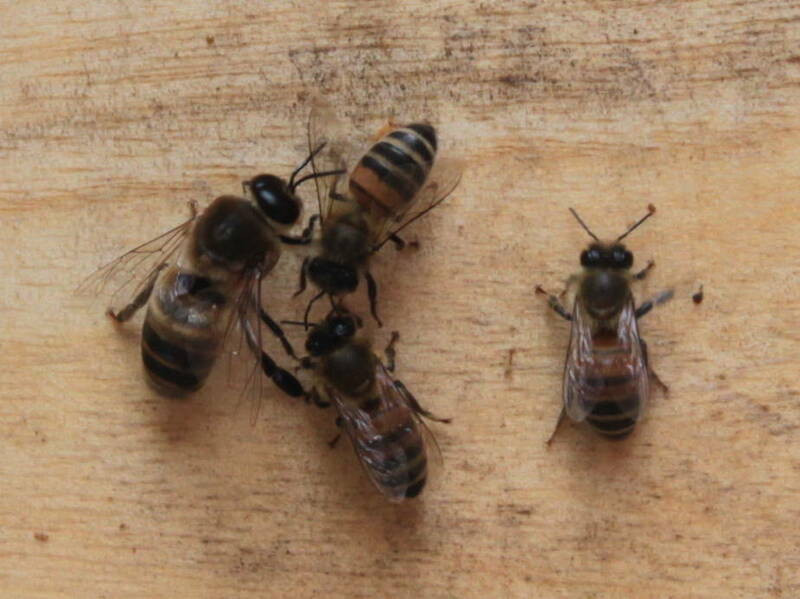 The time of day will vary from hive to hive and with the weather but it always seems to be in the afternoon. I wonder if perhaps drones have some employment within the hive during the morning that they are somehow relieved of in the afternoon..... perhaps keeping the brood warm until the ambient air temp in the afternoon means they are no longer required and can have a break. Either that or they are just very late risers! Drones have large eyes and hairy bums just like many blokes, so easy to spot ! Big eyes going over the top of their heads as they approach the queen from underneath in flight. Round bottom, no sting.